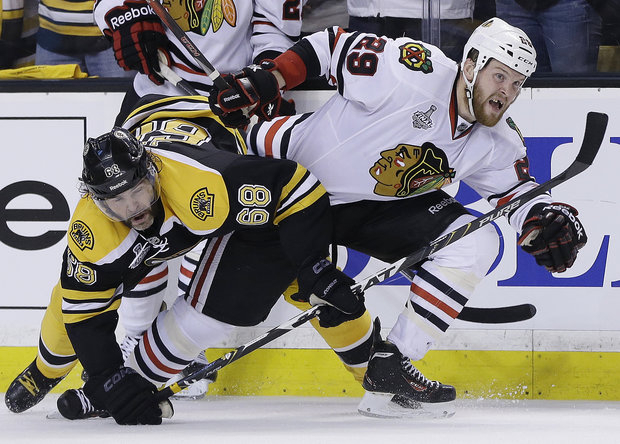 Bryan Bickell tangles with Bruins Jaromir Jagr. On social media, Blackhawks fans make it sound like the Stanley Cup is a lost cause. After losing 2-0 on Monday, tonight they play Game 4 in Boston with the Bruins up 2 games to 1 in the Finals. While fans are in a state of panic, Hawks players remain confident in Boston since they believe they can rebound and stay in this playoff series for the long haul. What do the Blackhawks have to do to even up the series? Power outage. With scoring at a premium it would nice if they could solve their huge problem with the power play. They are 0-11 in this series and the Bruins have scored twice with the man advantage. Not that they can magically make it right (since it has been wrong all season), but at least get some shots in. Win a face off. The Hawks lost 40 of 56 chances overall in Monday’s game. Bruins center Patrice Bergeron was nearly perfect handling that chore on Monday. Dave Bolland and Mike Handzus (and to a lesser extent, Jonathan Toews) were completely handcuffed in face-offs. If you don’t control the puck then, you relinquish your opportunities to score. Don’t get frustrated (Talking to you, Bolland.) That plays into the Bruins hands with turnovers and dumb penalties. Boston can frustrate a team: they know how to take advantage when they get into a player’s head. Get some traffic in front of the net Yes, Zdeno Chara is a big dude and the Bruins are tough. In the first game, Andrew Shaw did a decent job there. Bryan Bickell has not been a factor since the previous playoff rounds. Another aspect missing from the first game, Hawks also did plenty of hitting, that hasn’t been the case since that overtime win. Set some goals. All this points to is putting the pressure on Boston goalie Tuukka Rask. The Blackhawks speed and skill has been negated by the Bruins defense. Hoss in the saddle. Coach Quenneville said yesterday that Marian Hossa will likely play tonight. Hossa is one of the most productive players on the ice: he has 14 points in 9 playoff games this year. Ben Smith is a good player, but is limited to match what the Slovak winger can bring this situation. Line dancing. Quenneville has to make the right moves with his lines. The Hawks&apos; coach has been able to mix and match and it has worked more often than not. Now he has to be almost perfect, especially if his team suffers another loss. Going with Viktor Stalberg or Brandon Bolig should work, and maybe putting Patrick Kane and Toews together. Heads were still scratching with Ben Smith replacing Hossa since Smith had not played in quite a while. Coach Q was asked several questions about the mystery surrounding not the injury, but when it happened and how it was handled. There was no direct answer. Both teams had optional work-outs yesterday, so few players practiced. Trying to read the body language of the Blackhawks in the locker room, you would have no clue they are down in this series. Mainly, they know if they even the series tonight, then all, or most, of the problems have been solved by the Hawks. It is hard to tell if their confidence is wavering. That will be determined when the puck drops for Game 4 in Boston.